Knoxville’s Bill Page playing in front of Malaprop’s. For quite some time, Bill Page was one of a very small number of busking musicians on the streets of Knoxville, TN. It’s not a town that has traditionally been known as a busking hotspot, but over the last few years this has been changing, and Page is at least part of the reason why. Some of it is his music, to be sure, but just as importantly, it’s because of his defiance of anti-busking policies by the Knoxville police. Back in the summer of 2010, Page was issued a citation for obstructing a 10-foot sidewalk with his performance. According to Page, the initial interaction with the police was more them telling him to move along, and him refusing to because busking isn’t illegal in Knoxville. The police said it was, and when it turns out they were wrong, Page says they “went fishing” for something to cite him with. If it sounds a little absurd, it’s worth noting that even the local media thought the whole thing was hogwash. The charge didn’t stick, and Page completely won his day in court. 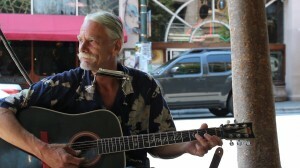 Since then, Page says, Knoxville has become a much friendlier place to busk. Maybe too friendly, actually, as he says that many of the new crop of “buskers” are actually panhandlers who have taken to using guitars as a kind of camouflage, camping out at the best spots downtown and never actually playing a note until the cops show up. It’s a sort of “Be careful what you wish for” lesson, and it ultimately resulted in Page taking a little time out of the Knoxville scene to try the more busker-friendly streets of Asheville. Here, he plays his original tune “If I Were You And You Were Me” in front of Malaprop’s Bookstore and Cafe.